GeneTegra is a novel integration application that allows users to locate, browse, and query disparate data sources from a single interface. 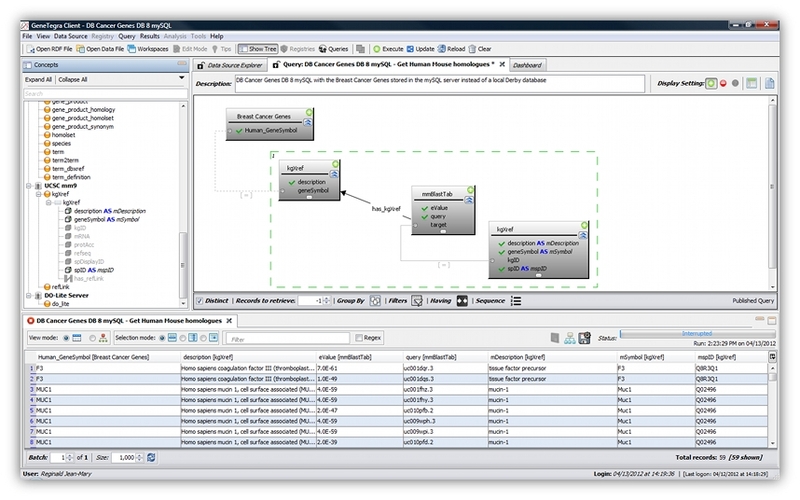 It performs data linking by leveraging the ASMOV ontology alignment component and provides extraction functionalities for heterogeneous data sources. This is accomplished without having to create a physical data warehouse. GeneTegra improves turnaround time and reduces the time spent on manual data management and data abstraction processes. With its on-demand integration and sharing capabilities, GeneTegra enhances team-based research and reduces the existence of data silos. ASMOV, which stands for Automated Semantic Mapping of Ontologies with Verification, is an automatic ontology alignment tool which produces class-to-class, property-to-property, individual-to-individual mappings. Although it was originally designed to facilitate the integration of heterogeneous systems, using their data source ontologies, it can be used to align ontologies from any domain. Although ASMOV is an automated process, it does not ignore the user interaction aspect that may be required to obtain perfect alignments. As a result, the ASMOV User Interface include a component that allows the user to review the alignments generated and address the errors that may exist. Since a single change may render a alignment incoherent, ASMOV will revalidate the alignment while considering the user inputs as partial alignment. By default, the lexical matcher of ASMOV, which calculates the lexical similarity between entities, uses WordNet. However, other background knowledge may be more appropriate for other domains; for example, UMLS is better suited to alignment medical ontologies than WordNet. Consequently, ASMOV defines interfaces that enables expert users to implement adapters to other background knowledge. Two adapters are included with ASMOV: a WordNet and a UMLS adapters.